No matter what your size, here are some habits and tips that will help you have the healthiest pregnancy possible. When I found out I was pregnant I was thrilled... and then almost immediately nervous. As someone who is overweight, I worried about the health implications of carrying extra weight throughout pregnancy. However, I soon realized that what I was eating and how much I was exercising were much more important than my waist size. "Achieving a healthy pregnancy, no matter mama-to-be's weight or dress size, is largely based on healthy habits," says Kendra Tolbert, a registered dietitian and nutritionist from Alexandria, Virginia, and owner of Live Fertile, a site that provides moms-to-be information on healthy pregnancy. 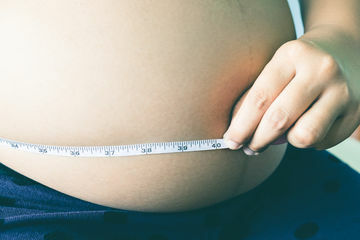 The truth is that navigating an overweight pregnancy is extremely common, since 53 percent of American moms-to-be start their pregnancies overweight, and half gain more than the recommended amount while they are pregnant. No matter what your size, here are some tips that will help you have the healthiest pregnancy possible. If you're planning to get pregnant, take the year before conceiving to get yourself as healthy as possible. That's how Angela Grassi, registered dietitian and founder of the PCOS Nutrition Center, prepared herself for pregnancy. The process included making sure all her labs were in normal ranges, taking a prenatal vitamin, and working out regularly, she says. Making small changes toward health can make a big difference during your pregnancy, said Diane Vista-Deck, MD an OB/GYN at Harper University Hospital in Detroit, Michigan. “Even a small weight loss of 5 to 7 percent can significantly improve pregnancy outcomes,” she said. If you're already pregnant or celebrating a surprise, it may not be the right time to start a new vigorous workout routine, but you could maintain the same amount of exercise you were doing before, and talk to your doctor about incorporating a bit more movement. “Women who are not actively exercising [before getting pregnant] can start walking, take prenatal yoga classes and do daily stretches to increase their activity levels,” after getting a positive test, Dr. Vista-Deck said. During her pregnancy, Grassi asked for a glucose tolerance test, generally given between 24 and 28 weeks, right at the end of the first trimester in order to monitor for gestational diabetes and catch it early on if it were to become an issue. According to Dr. Vista-Deck, this is a good, proactive approach for overweight moms-to-be, who are at increased risk for gestational diabetes. It's easier said than done, but try not to stress about your weight during your pregnancy. Instead of worrying about the number on the scale, focus on eating healthy, nutritious food to fuel your body. This is advice that goes for everyone. Fueling your body and baby with whole foods is a great way to get the nutrients you need and stay full for longer. "By focusing on fueling her and her baby with proper, nutrient-dense foods that are low in added sugar, such as lean proteins, whole grains, unsaturated fats and fruits and vegetables, the mom-to-be will be setting herself and her baby up for a lifetime of success," says Elizabeth Shaw, a registered dietitian nutritionist in San Diego. In addition to upping your intake of fruits and vegetables, don't shy away from healthy, low-mercury fish. Generally, the heavier a woman is the less weight she needs to gain during a pregnancy. That's because women who are already overweight have more fat deposits that the fetus needs to develop properly, said Grassi. The Centers For Disease Control and Prevention recommends overweight women (BMI of 25 to 29) gain 15 to 25 pounds during a pregnancy, and that obese women (BMI over 30) gain 11 to 20 pounds. Dr. Vista-Deck recommends these numbers to her patients as well, reminding them that following these guidelines are important for their health and that of their baby. “With early initiation of prenatal care, routine followup and close monitoring, an overweight mother can have very normal and healthy pregnancies and babies,” she said. That's good news for everyone!